Not only is the loss of topsoil to erosion a worldwide environmental issue, but it can also result in hefty fines from city and state departments. On organic farms, soil erosion is simply the gradual process of wind, water, and environmental factors deteriorating the land. It often becomes a catch 22 when farmers cause their own erosion while maintaining their crops. In another light, this is a good thing because it means you can take control of your soil and reduce the acceleration of erosion caused by agriculture and construction. As an organic farmer, you’ll undoubtedly want to avoid legal penalties, as well as preserving your land. Although states like Maryland and Maine freely publish their erosion and sediment control laws, you still see news stories popping up about city and state lawsuits over erosion. For example, the Wisconsin Department of Natural Resources pursued an excavating company for a $25,000 erosion control fine, and the city of Raleigh, North Carolina sued a real estate developer for a $1.5 million in erosion control damages. 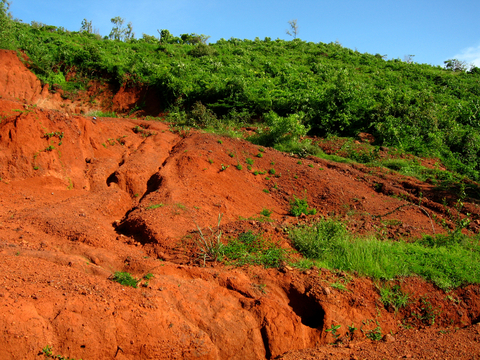 So how can you prevent erosion control on your own organic farm? Although some acts of nature, like high winds and flooding, are out of your control, you can still take preventative measures to reduce the effects of erosion. Since high winds pick up fine soil particles and deposit them downwind, you should use appropriate tilling practices, keep the soil full of moisture, and incorporate economical methods of drip irrigation. Simple trees and shrubs can provide windbreaks, especially when located to block prevailing winds. Grass and legume crops can provide wind barriers for more delicate row crops. Since falling rain can reach speeds up to 30 mph, even simple rain drops can be devastating to an organic farmer because soil that becomes detached moves much easier. Farmers can reduce the intensity of water erosion by practicing contour cultivation, where planting follows the contours of a field and breaks up water’s down-sloping movement, and strip cropping, which alternates different crops in the same field. In addition to these sustainable methods, organic farmers tend to incorporate the practices crop rotation to increase nutrients in the soil and decrease chances for disease infections and build bench-like terraces to allow water pooled on slopes to spread out and infiltrate the soil. And when all else fails, farmers resort to artificial devices to block erosion, such as rock barriers, earthen dams, timber, and bricks. Soil-saving dams trap and waterborne sediments, and flood control dams collect and store runoff water with nutrients. Organic farmers who tend to favor animal manure for fertilizer may need to alter the pH levels of the soil with naturally-occurring lime and sulfur. To learn more about preventing soil erosion in different farming regions, FarmInfo.org is a great resource. Shirley R. - A great place to learn about limiting erosion in your specific area would be a local nursery or gardening group. They will know exactly what you are talking about and make recommendations. Sammy Largo - Yes Shirley! I went to a near-by plant shop to ask about gardening and they were able to give me lots of specific info about the area. Home Depot on the other hand is less informative! Kat Braza - I live in an apartment, I don’t have to worry about this hahaha. $1.5 million though? That is a serious fine. © 2019 Seagate World|ProPhoto Photographer Template by NetRivet, Inc.